The art of appreciation. Show Mom your gratitude in a most glorious way with this unforgettable Mother's Day delivery! 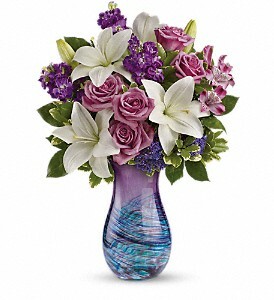 The lush, luxurious bouquet of roses, lilies and alstroemeria will make her feel adored when it's delivered in this show-stopping hand-blown art-glass vase, crafted in the tradition of fine Venetian glass.